A small pine from the mountains of central China. Following decades of deforestation some recovery and expansion appears to be taking place. Currently this species is assessed as Near Threatened. 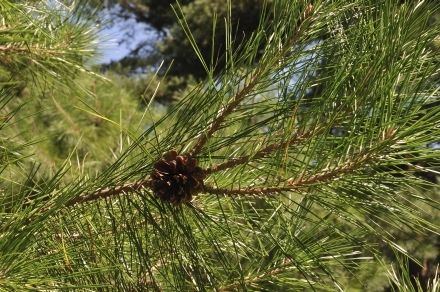 This species has been treated as a variety of Pinus tabuliformis in the Flora of China, Vol. 4 (1999) and is indeed similar in many characters to that species. Its leaves are not wider than 1 mm and its seed cones are smaller, with scales that have only slightly raised apophyses. It was also classified as a variety of P. massoniana, from which it differs in its much shorter leaves, its uninodal growth of shoots, smaller, nearly globose-ovoid seed cones, and relatively shorter seed wings. In addition to the differences mentioned above recent genetic studies have confirmed its status as a distinct species that is only morphologically similar to P tabuliformis and more closely related to Pinus hwangshanensis (Liu et al. 2012a, 2012b). Pinus henryi is most common at middle elevations in the mountains of Central China, and occurs from 1,100 m to 2,000 m a.s.l. It prefers dry, sunny slopes and hills, where competition from broad-leaved trees is less severe as the woods are more open and lower than in more mesic sites. It is also a pioneer in secondary vegetation, and is there commonly mixed with deciduous shrubs and trees, in later stages of the succession often giving way to these angiosperms. This species is similar in its wood properties to P. tabuliformis, but it is less common and widespread, and as a consequence of this less important as a timber tree. 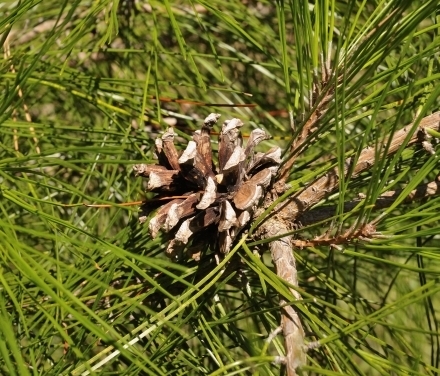 Pinus henryi is apparently absent or very rare in cultivation; it was not introduced to Europe when the opportunity arose during the early decades of the 20th century. The China Plant Specialist Group (CPSG) assessed this species as Vulnerable under criterion A1c using the 3.1 version of 2001(Wang and Xie 2004). This implies that there has been a decline over the last 80 or so years of at least 50% in the population. No data have come to the Conifer Specialist Group (CSG) in support of this claim. Its habitat and capacity to colonize seem to indicate against such a high rate of reduction, and it seems therefore appropriate to keep it in its category of Near Threatened as before (it almost qualifies as threatened under criterion A2cd). Deforestation and cutting for local use are likely to have impacted on the area of occupancy of this species. This species is present in some protected areas within its range. Populations of P. henryi are strongly differentiated and can potentially hybridize with P. tabuliformis. All natural populations should be included in forestry management and pine reforestation should be implemented with caution in the natural range of this species. Farjon, A. 2013. Pinus henryi. The IUCN Red List of Threatened Species 2013: e.T37555A2866837. http://dx.doi.org/10.2305/IUCN.UK.2013-1.RLTS.T37555A2866837.en. Downloaded on 16 December 2016. Liu, Z., C. Cheng & J. Li 2012. High genetic differentiation in natural populations of Pinus henryi and Pinus tabuliformis as revealed by nuclear microsatellites. Biochemical Systematics and Ecology 42:1-9. Liu, Z., X. Yang, H. Zhang, Z. Zhang, J. Li 2012. Systematic position of Pinus henryi (Pinaceae) as revealed by multiple evidence. Nordic Journal of Botany 30:671-679. P.Thomas, 2016. Pinus henryi, from the website, Threatened Conifers of The World (http://threatenedconifers.rbge.org.uk/taxa/details/1139).